At KenoSites.com.au we’re always on the lookout for exciting new online keno variants bringing something fresh to the table, which is why we were thrilled to discover Kenotronic from 1X2 Gaming. Find out more about this electrifying Internet keno game and where you can play for real money bets. Where can I play Kenotronic for AUD? Kenotronic can be difficult to find when playing at online casinos, but luckily for us it’s available at Emu Casino, one of our top rated online keno sites. Best of all it’s available for instant-play, which means no downloads are required as you can play directly over your Web browser. You’ll find Kenotronic in the ‘Other Games’ category along with a handful of other great online keno variants, including Monkey Keno, Jackpot Keno, Keno Kick Off and Keno Lab. All keno games at Emu Casino can be sampled for free in practice mode so you can get a feel for the game before playing for real money, with safe deposits then available in AUD using trusted payment methods like Visa, MasterCard, Paysafecard, Skrill and Neteller. New to online keno, or the game in general? New players can learn the ropes by visiting our new players guide to online keno rules and payouts. Kenotronics follows the traditional keno format, only the game is presented as a modern electronic contraption to give it a slick, space-age feel, complete with electronic soundtrack. It’s an 80 ball keno game, where the player chooses up to 15 numbers from a grid numbered one to 80. The RNG (random number generator) then selects 20 balls from the pit, with money won if you manage to match any of your picks. 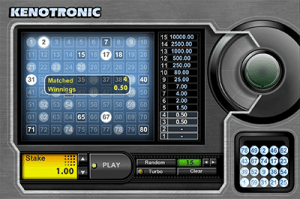 Just like classic keno, Kenotronics is purely a luck based game and it comes with a theoretical RTP of 87.50%. How much can I win playing Kenotronics? The amount of money you can win playing Kenotronics depends on how many numbers you choose to play. For example, if you choose up to nine numbers, hitting even a single match will result in a payout. However, choosing 12 or more numbers will require you to get at least three matches before you’ll receive a win. The most you can win in Kenotronics is 10,000 times your wager, which would require you to match all 15 of your picks. When you select your wager and make your picks, you’ll notice the payscale to the right hand side of the grid automatically updates, so you can always refer to the this to understand how much you stand to win. Head to EmuCasino.com to sign up for an account and make an AUD deposit, then open Kenotronics directly over your Web browser. Use the arrow buttons at the bottom of the keno grid to select the size of your wager. Kenotronics offers a minimum bet of $0.05 with a maximum bet of $20.00 per game, making it suitable to recreational punters and high rollers. Changing your stake will increase or decrease the potential payout of the game. Click on the keno grid to select up to 15 numbers from the given 80, or you can click the ‘random’ button to have the computer automatically select numbers on your behalf. Once your bet is in place, hit the play button and the game will randomly draw 20 numbered balls. As each ball is drawn, its corresponding number on the grid will light up, making it easy to see if any of your picks have been matched. If you have got any matches, your potential payout will also become highlighted in the payout table. When all balls have been drawn, an announcement will come up displaying your number of matches and the amount of your winnings, with all wins automatically credited to your account. Remember Emu Casino offers the option of playing Kenotronics in demo mode for free, so you can try playing with different stakes and numbers of picks before risking any real money. As keno is a luck based game, there are no particular strategies you can use to increase your chances of winning at Kenotronics. Remembering this fact is important to ensure you gamble responsibly and keno remains the fun game of chance it was intended to be. If you’re really chasing those big wins, keep in mind the more numbers you choose, the higher your potential payout, so choosing the maximum of 15 numbers is a good strategy if you’re hoping for a 10,000X jackpot. If you want to really speed things along, clicking the ‘turbo’ button at the bottom of the screen will result in balls being drawn instantly rather than watching the results unfold one by one, so you can play more games quicker. Sign up to play Kenotronic at Emu Casino and you’ll receive $3 free with no deposit required, followed by a $300 triple welcome bonus when depositing real money for the first time.